You could instead choose to add this property to your shortlist and download all of your selections in one neatly sorted single PDF. Ground-floor self-contained workshop units, fully fenced and gated site, recently refurbished, available on flexible terms. Modern workshop building and yard. The building is steel portal frame with cavity wall to 2.5 m. Walls and roof of profile steel sheeting. Sale price £180,000. Workshop 2383 sq ft/221 sq m, office,amenity area 478 sq ft/44.4 sq m and mezzanine of 478 sqft/44.5 sq m. The yard extends to 5975 sq ft/555 sq m. Rateable value £8600. The unit is of steel portal frame construction with profile steel cladding to walls and roof. It is an industrial workshop /warehouse facility with office space extending to 15983 sq ft/1485 sq m. The unit has a PA rental of £32000 and an RV of £30500. With Planning permission for Waste Transfer Station and Recycling Depot. The site extends to just under 6 acres located on Mainsforth Terrace in Hartlepool. The area has good road links being nearby to the A689 which in turn provides access to the A19, A1M and national road network. The site can be purchased as a single lot or offers will be considered for part. Located on Graythorp Industrial Estate within easy access to Seal Sands and the A19. Workshop, office and yard which has recently been refurbished. 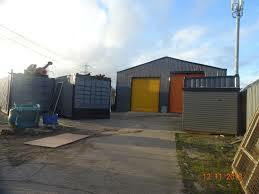 The site would suit a variety of light industrial uses or recycling subject to any necessary planning consent. The site potentially could be sub-divided if required. A substantial site which provides a range of high quality offices, workshop space and storage land. Suitable uses would include office, light industrial or recycling subject to landlords consent and subject to any necessary planning consent. The site is located on Graythorp Industrial Estate which is to the southern fringe of Hartlepool. Nearby occupiers include a variety of manufacturing businesses, recycling, vehicle hire and motor trade.